This line is closed. There are occasional rumours of the re-opening of the Border Union Railway to Riccarton from Carlisle and then the Border Counties Railway to Kielder in connection with the Kielder forrestry. The line between Kielder and Falstone is now under the waters of the Kielder Water reservoir. Note: Tarset mis-spelled 'Tarsett' in diagram. 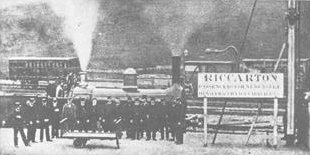 First train to arrive from Newcastle to Riccarton Junction, 1864. This line ran through moorland and farmland in Northumberland. There was a colliery at Plashetts but little other industry. The Border Counties Railway joined the Border Union Railway at this junction by Riccarton Station. The junction faced west for Edinburgh. Saughtree was a single platform station with a passing loop. Following closure the track was uplifted. This station has been beautifully restored, track le-laid and a locomotive now operates over a short section of line here.. These photographs were recently sent me by Shelley Mann. This station still stands and look little different from the days when it was open. It is now in use as a house. Deadwater was the Scotland/England border on the route. The station building, now a house, still stands here by the 'Station Garage'. The station was renamed Kielder Forest in 1948. The Kielder Reservoir now floods much of the route eastwards to Falstone, but a very fine castleated viaduct near Kielder Castle still stands. About half a mile east from here the line is obliterated as its route is now reservoir and some scouring and embankment removal has removed the traces of its course. Slightly further east its course would be below todays water level. The site of the halt is now usually underwater. At low water nothing remains of the course of the railway. There is a proposed Green Dragon Railway to be built by Kielder Water. This station had a single platform and very tall signalbox. This was a fairly substancial station having a waggonway branch which ran from here (where there were workshops, coke ovens, screens and a brickworks), up Slater's incline, to the Plashetts and Far Colliery. To the north of the station were one or two houses and at the end of the waggonway a miners village. The bottom of the incline is now a pier used by the ferryboat service on the lake. This station still stands and is in use as a house. It was a single platform station. The stone signalbox still stands. There was a mine at Falstone which had its rail served screen by the railway and near the station. To the west of the station was the Thorneyburn Tileworks. Text not yet entered. The station site was until recently a council roads depot, it is now a museum. The station itself still stands with a portion of platform. The Heritage Centre in Bellingham has a brass letterbox which was made from a portion of the locomotive known as "The Diver" which fell off the Tay bridge when it collapsed in 1879. This was the letter box for the station house at Dalhousie for many years. This was a junction with the Wansbeck Railway which ran east of here to Morpeth. The yard at Reedsmouth remained open after closure of the Border Counties line to freight as the Wansbeck route was used to run from here to Bellingham. To the north side of the route to Riccarton there was a locomotive shed used to stable historic locomotives during the war to save them from bombing raids. There were two platforms on the Riccarton route and one platform on the Wansbeck route. The substancial station building still stands and the signalbox has been turned into a house. The Border Counties Railway joined the Newcastle and Carlisle Railway at this junction to the west of Hexham. The junction faced Newcastle. The signalbox here also controlled the Hexham and Allendale Railway which also left from an east facing junction. The North British Railway arranged for access to the station in Hexham, on the Newcastle and Carlisle Railway, from Border Counties Junction. This was carried on to Newcastle with the condition that the North Eastern Railway had access to Edinburgh Waverley from Berwick along the North British Railway's mainline.